Located in Mauricie, this motel is within 1 mi (2 km) of Basilica of Notre-Dame-du-Cap and Maison Rocheleau. Golf Club Metaberoutin is 2.9 mi (4.7 km) away. Where to find Cap de la Madeleine hotels near an airport? Where can I find hotels in Cap de la Madeleine that are near tourist attractions? Visitors are simply spoiled for choice when it comes to finding the best accommodation in Cap de la Madeleine. 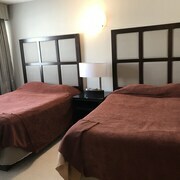 Our accommodation section lists 21 accommodation options within a 0.1-kilometre (0.06-mile) distance of Cap de la Madeleine's center. Wanting a hotel within walking distance of downtown Cap de la Madeleine? 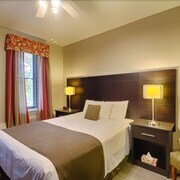 Hotel Penn Mass and Auberge Motel Le St-Georges will suit your needs. The Auberge Godefroy is 10 kilometres (6 miles) from the middle of Cap de la Madeleine. 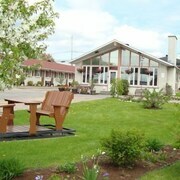 Alternatively, the Delta Hotels by Marriott Trois Rivieres Conference Centre can be found 6 kilometres (4 miles) away. 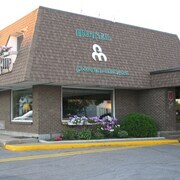 Another option is to book a room at the Hotel Montfort Nicolet or the Auberge Le Florès. If time allows, you should discover more of Mauricie. Explore Mauricie's old towns, churches and cathedrals. Visitors can also take the time to to admire the region's forests and rivers. In this region of Canada tourists can also try their hand at cross-country skiing. 6 kilometres (4 miles) from Cap de la Madeleine is Old Trois-Rivieres, where you can spend the day enjoying Galerie d'art du Parc and Ursulines Museum. 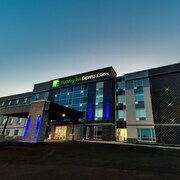 If you'd like to visit Old Trois-Rivieres, check Expedia's booking pages for the latest deals at the Hôtels Gouverneur Trois-Rivières and Hotel L'Urbania. 8 kilometres (5 miles) to the southeast of Cap de la Madeleine, you may also choose to stay at Becancour, home to the Manoir Becancourt and Hebert Hotel. While visiting Becancour, set aside a little time to check out the Godefroy Golf Club and Quebec Biodiversity Center. If you love sports and like to watch games you might like to visit Hippodrome Trois-Rivieres, which is 7 kilometres (4 miles) to the southwest of Cap de la Madeleine. 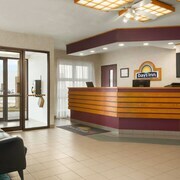 Those wishing to find a room or apartment near to the action can choose from the Super 8 Trois-Rivieres or the Comfort Inn Trois-Rivières. Jean Lesage International Airport is a logical airport, and is 95 kilometres (60 miles) from Cap de la Madeleine. 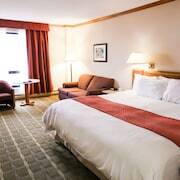 Nearby hotels include Grand Times Hotel Quebec City Airport and Comfort Inn Airport East- Ancienne Lorette. What are the most popular Cap de la Madeleine hotels? Are there hotels in other cities near Cap de la Madeleine? 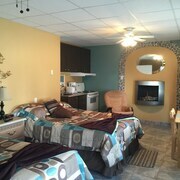 What other types of accommodations are available in Cap de la Madeleine? Explore Cap de la Madeleine with Expedia.ca’s Travel Guides to find the best flights, cars, holiday packages and more!